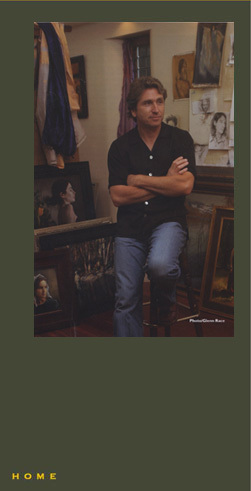 The paintings of Glenn Harrington are recognized and collected internationally and have been featured in such publications as American Arts Quarterly, American Art Collector, International Artists Magazine, the covers of American Artist & US Art, New Art International, The New York Times, and Philadelphia Inquirer. He has had numerous solo exhibitions in New York, Japan, Charleston, South Carolina and Pennsylvania, and has exhibited at the Norman Rockwell Museum, The Museum of American Illustration and the USGA Museum. Glenn’s paintings have been published on over 500 book covers including such classics as Room with a View, Pride and Prejudice, Wuthering Heights, and two series of oils on the plays and poetry of William Shakespeare and W.B. Yeats. Portraits of Payne Stuart and Ben Hogan hang at Murfield Village Golf Club and twenty others are in the permanent collection at the World Golf Hall of Fame; thirty oils, highlighting the career of Jack Nicklaus, were purchased by the Jack Nicklaus museum. Harrington’s recent commissions include a portrait of Wilbur Ross and three murals highlighting golfers Greg Norman and Padraig Harrington installed at Doonbeg Golf Club, County Clare, Ireland in 2006. Eleanor Ettinger Gallery, One-Man Exhibition, New York, NY. March 12 - April 5, 2009. View Exhibit. Eleanor Ettinger Gallery, "The Figure in American Art", Group Show. New York, NY. Richland Fine Art, Oil Panters of America, Award of Excellence, Eastern Regional Exhibition. Nashville TN. Wells Gallery, Father and Son Exhibit, Duel Show with Evan Harrington, Charleston, SC. Oil Panters of America, Award of Excellence, Western Regional Exhibition. Oil Panters of America, Award of Excellence, 17th National Juried Exhibition. The Weatherburn Gallery, Oil Painters of America, Eastern Regional Exhibition. Naples, FL. Wayne Art Center, Group Portrait Show, Invitational. Wayne, PA.
Art Obsessions Gallery, Group Show, Tokyo, Japan. Medici Gallery, Group Show, London, UK. Wells Gallery, Solo Exhibit, Charleston, SC. Travis Gallery, Recent Works, New Hope, PA.
Eleanor Ettinger Gallery, Solo Exhibit, New York, NY. Eleanor Ettinger Gallery, "The Figure in American Art", New York, NY. View Exhibit. Travis Gallery, Recent works, Solo Exhibition, New Hope, PA. View Exhibit. The Draper Grand Prize, annual Juried Exhibit of Portrait Society of America, Washington, DC. May, 2007. See Prizes. Award of Excellence, annual Juried Exhibit of Oil Painters of America, Fredricksburg, Texas. May, 2007. Finalist in Art Renewal center (ARC) annual Juried Exhibition, 2007. Pride and Prejudice, Room with a View, Women in Love, Dangerous Liaisons, Man and Superman, Mansfield Park and Silas Marner. CBS Films:Poster art for “The Inheritance” by Louisa May Alcott. United Artists: James Bond Film Festival poster art - Sean Connery/Roger Moore. HBO Films: ”Murrow” Danial Trevonte, Poster and Promo art. World Golf Hall of Fame: Portraits of inductees: (Partial List) Ben Crenshaw, Bernhard Langer, V.J.Singh, Payne Stuart, Tom Kite, Nick Price, Greg Norman, Gary Player, Arnold Palmer. and Lee Travino among others. Golf Channel: Group portrait of Tiger Woods, Nancy Lopez, Jack Nicklaus. Gary Player Group: Art commemorating Gary Player’s 50 years in golf. Sterling Publishing: Two books of 40 paintings illustrating the poetry of W.B.Yeats and William Shakespeare. Disney Publishing: 50 paintings for children's book Tarzan. Doonbeg Golf Club, County Clare Ireland: 3 Murals depicting Designer Greg Norman and Irish golfer Padraig Harrington, installed in the clubhouse.